A spigelian hernia is an uncommon hernia, found just to the side of the midline in the lower abdomen. It is seen more often in women age 30 -70 years. This hernia is due to a tear in the tissue between two groups of abdominal muscles. Sometimes it is called a lateral ventral hernia. If untreated they can cause a painful lump and can become strangulated. This is a surgical emergency and the patient must seek immediate medical attention. Sometimes these spigelian hernias can be difficult to detect and often do not cause any visible swelling (except in very thin patients). Most people with these hernias will experience a vague discomfort or pain on lifting or straining. Diagnosing a spigelian hernia can be difficult. Patients need to be examined by a specialist. Often a focused ultrasound scan or CT scan might be required to help with the diagnosis. 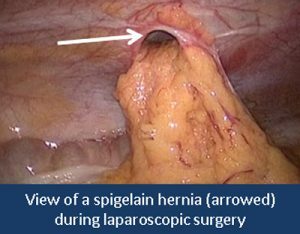 Spigelian hernias need to be repaired with surgery. The operation is performed under general anaesthetic (with you asleep). Your specialist will discuss with you whether a laparoscopic (keyhole) operation is possible or whether an open approach is needed. When a laparoscopic operation is performed you will have a small scar near the umbilicus (tummy button) and two smaller scars lower in the abdomen. A mesh is placed inside the abdominal cavity and secured in place to plug the hole. Sometimes an open operation is necessary. This involves a scar over the site of the hernia and the weakness is repaired with a combination of permanent sutures and mesh. You can download a patient information leaflet here.